The weather was beautiful sunny and warm no rain in sight, Bud and I went for am drive after we left the venue and I don’t think I have ever seen the surrounding area so dry and white, there was very little grass in the paddocks. I personally thought there were less public attending as other years, as these displays are more or less the same each time, people seem to give some of them a miss as the entrance fees mount up for a family, and there has been the Kumeu Hot Rod Event, Galaxy of Cars at Western Springs, Concurs at Ellerslie Race Course, and Pukekohe Swap Meet Display all since Christmas. 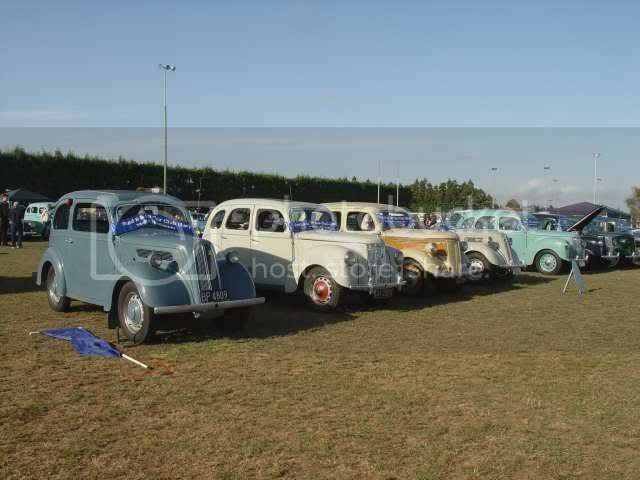 We had an area in the middle of the paddock, and managed to fit in Leonie, 37 Ford 10; Dennis, 46 Ford; Bud and Thelma, 1950 Prefect; Paul and Delia in their Prefect. John brought three cars with members of the family and Brian as drivers (the convertible, Anglia and Prefect) and Steven his 1940 Prefect. In all we had a good display with our new blue windscreen sashes and the blue corner flags in stands.